EPHESIANS 5:20 KJV "Giving thanks always for all things unto God and the Father in the name of our Lord Jesus Christ;"
17Wherefore be ye not unwise, but understanding what the will of the Lord is. 18And be not drunk with wine, wherein is excess; but be filled with the Spirit; 19Speaking to yourselves in psalms and hymns and spiritual songs, singing and making melody in your heart to the Lord; 20Giving thanks always for all things unto God and the Father in the name of our Lord Jesus Christ; 21Submitting yourselves one to another in the fear of God. 22Wives, submit yourselves unto your own husbands, as unto the Lord. 23For the husband is the head of the wife, even as Christ is the head of the church: and he is the saviour of the body. euermore doynge thankingis for alle thingis in the name of oure Lord Jhesu Crist to God and to the fadir. 5:20 Giving thanks - At all times and places. And for all things - Prosperous or adverse, since al] work together for good. In the name of, or through, our Lord Jesus Christ - By whom we receive all good things. 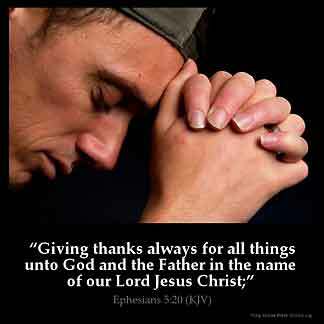 Eph 5:20 Giving thanks always. This is often done in songs. In the name of our Lord Jesus Christ. All our worship is in the name of Christ. THANK YOU HEAVENLY FATHER IN JESUS NAME FOR ALL YOUR BLESSINGS AND ALL YOUR BLESSINGS TO COME.THANK YOU FOR BEING SO FORGIVING OF MY SINS.IN JESUS NAMES I PRAY. I am to always have a thankful heart. Thanksgiving unto my Lord opens the door to Blessings . I am so very Grateful and in Thanksgiving always for his Wonderful and Great Salvation He has provided through Jesus Christ. I am so Glad and Happy that I am a part of the family of God. I am Thankful to have a copy of His word. That right there is a tremendous Blessing. I have access by faith into this Grace wherein I stand. It is a Great privilege to be a child of the Great and Living God Almighty. It is certain that we have all things in God through Jesus Christ our Lord and Saviour, and the use of father does show that he cares and he supplies all our needs. By God we know he is able to do everything and nothing is impossible with him. So thanking God "all things " is a kind of faith that shows. that we know who he really is. A supplier and able God. When you feel down, you may find it difficult to give thanks. Take heart God works all things out for good if we love him and are fitting unto his plans (Romans 8:28). Thank God, not for your problems but for the strength he is building in you through the difficult experiences fothe life. You can be sure that God's perfect love will see you thought. When offering prayers, we want to remember to give thanks to God. There are so many things to be thankful for each day and we want to make sure we are thanking God and not just asking for things in our prayers. As this verse brought out, we want to offer our prayers in the name of Christ Jesus.